What is a Usual Thermage Procedure Like? Clients can expect Thermage procedures to last a mere 15 to 90 minutes, depending on the treatment area. General anesthesia is not required, but to make sure you are comfortable the doctor may offer light pain medications prior to treatment. During the treatment, you'll feel a brief, heat sensation each time Thermage delivers radiofrequency energy to the underlayer of your skin. This indicates that your collagen is being stimulated and tightened. Upon completion of just a single treatment, you will already see remarkable results. Your skin will appear more taut and more refined. As an extra bonus, because Thermage is focused on extended development of skin, you can expect the results to refine as the months pass. In terms of recovery, patients who come in for Thermage can walk out of the physician’s office and resume their daily activities right away. There is less pain with Thermage when compared to a facelift. Although you may feel a fleeting sensation of heat, the discomfort is brief. If you have sensitive skin, you may want to later apply a topical anesthetic to the treatment surface. One principal concern of individuals interested in Thermage is the level of discomfort involved in the procedures. Individuals who have gone in for Thermage procedures have said that the procedure is not painful at all. They report to have only felt a minimal heating sensation throughout the treatment. This warmth is held at a pleasant level through a invigorating spray discharged by the ThermaTip. The spray is also used to safeguard the skin’s surface. As with the common facelift, the risk of infection or scarring is present and, depending on the skill of your surgeon, you may have paid a bundle for something that does not even meet your expectations. With Thermage, some of the potential side effects include bumps, redness, swelling and blisters; all of which will usually disappear in a couple of days. Thermage doctors often consider Thermage to be the top of the line treatment for smoothing and contouring skin. This is because it provides subtle, yet visible results that can last up to two years. Thermage doctors can perform the treatment in a single session that lasts about an hour or in several sessions. 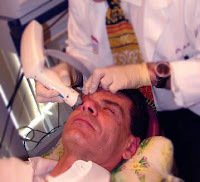 Thermage has been used in more than 450,000 procedures and over 2,200 medical practices worldwide. It is preferred by doctors because there is no cutting, no injections, and no downtime in recovery.